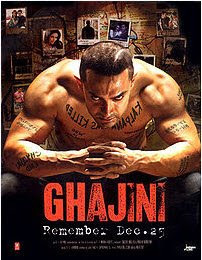 I went to see "Ghajini" only for Aamir. I cannot help imagine the long route from "Quyamat se Quyamat tak" that the veteran has taken. The obvious first question, "Was the Hindi remake better?". My answer - an emphatic "No" despite the changes Aamir has made in the final climax and reducing the overall violence. The main reason why I rate the Hindi remake poorer is Asin, Aamir's choice for heroine. 1. When I wrote my review of the original Ghajini(http://subashsworld.blogspot.com/2005/11/after-almost-decade-i-visit.html) two things that really put me off were - 1. The intense violence and 2. Asin's acting particularly in the love scenes. I remember while watching Quyamat Se Quyamat how sweet Aamir was and how Juhi was literally playing the fool (her entire role was one mad foolish trip) in the movie. In spite of that the talented Aamir was still able to exude his romantic power on screen becoming an overnight teen heart throb. In Ghajini Asin's deliberate introvert attitude doesn't even give him any room to be the romantic he is. I have reserved Asin's acting for another post. So in the end we find a zero-chemistry couple in a film which is supposed to be so full of love and all for and about love. I must say by using Asin and that too a second time a good script and opportunity has been wasted. Aamir could have settled for a zillion new girls instead of Asin. I don't know what her problem is but Asin HAS a problem when it comes to love scenes or romance. When you see it the first time you think probably the script demanded such an acting. But when it happens again, and again in more than one movie the viewer like me is totally turned-off. Like I mentioned before I will reserve more of this for another post. Besides these Asin is plumpier, given unnecessary make-up in several scenes and in most of the songs she is only cat-walking while Aamir is serioulsy trying to express his love. It looked outrageously comical. In the songs that are supposed to be "love songs" she is walking hither and thither, holding her hands over her head (really don't know what that move meant) with hardly any feeling for Aamir. In one of the white gowns she is even struggling to walk. But worse was when she confesses her love. It looked idiotic. More idiotic when she starts talking about the 3 Ambassador cars. It was pathetic. I sat there in the Cinema enduring her torture. In her laughing act in the bus the entire cinema was laughing to boo the scene. 2. Stale comedy - For people watching it the first time it might have struck but for those who have already watched the Tamil version it was boring with lines of the script copied everything verbatim. There was delay in dialogue delivery and some of the characters who did well in the original were crap in the Hindi version, like the role of Tinu Anand as the Ad director and the guy whom Asin chooses to imitate Sanjay. Another sad thing of watching the movie in Kerala was that no one was laughing for the jokes. 3. A R Rahman's music - As I write this ARR has already bagged a Golden Globe. But if you ask me Aamir should have simply used Harris Jayaraj and the original songs. Songs are literally crap in the Hindi version. Except for "Lattoo" which is not played/shown in its entirety and the lovely "Kaise Mujhe" sung so well by Benny Dayal. The song where Asin is introduced is a total flop with Asin dancing to "koothu" like beats in an elegant gown. Instead take a look at how Harris Jayaraj's song introduced her in the original version. and who can forget "Oru Maalai". Aamir could have just dubbed it into Hindi. 4. Aamir's rolled up sleeve in the formal attire didn't look like good costume design. Though Aamir looked older in the formal attire he looked younger and cute in the "toughy" look. 5. Jia Khan's acting in the final scenes where she let's Aamir off loose after the villains could have been avoided. 1. Jia Khan introducing herself as a medical student to Ghajini when the latter had actually come to watch her dance at her college show where she was dancing/singing "Latoo". 2. The cops who capture Aamir from the girls hostel do a thorough investigation and cannot find out who Aamir is? 1. The violence has been greatly reduced. Unlike the first one the ending in the Hindi version has been completely changed. The clobbering scene of Asin was what I was dreading to watch but just at the right moment (thanks to the power situation in Kerala) the power goes off at the Aynikkal cinema. But when the power was restored only a fraction of the scene was gone. 2. Aamir's sincere acting. All I can say is that he did his best. The only thing for which the audience were clapping for was when Aamir is introduced, removing his shirt to reaveal his (n) packs etc..
3. Asin, as in the original moved me in the crying/death scenes. Her fear was also enacted well. 4. Jia Khan's "Latoo" song was done well (both dance and song) but unfortunately it isn't shown in its entirety. This song was better than the one in the original. 5. Great Action - full points to the stuntmen. 6. Some scenes that offer clarity like Aamir exercising, what he does when he wakes up etc. I cannot recall them in the original but probably I missed them. 7. And my favorite of them all - The incredible last scene which was used as a closure for the film and its story. It is such a long shot taken (or seemed to be taken) in one continuous take. It was also perfect in expression and I wished Asin could have used that talent in the movie too. Final verdict - This is certainly a big break for Asin. The character of Kalpana was a prized role and Asin was fortunate to have got it. The role is one where many viewers particularly in the north aren't going to see her defects. However I haven't seen the media report on Asin in the movie. Most of the accolades seems to be going to Aamir who of course is worth of the hard work he puts into each and every movie of his. Ghajini is turning out to be the biggest grosser ever for an Indian movie. Only goes on to show how movies made in the South really matter. For years Anil Kapoor used remakes of Tamil Movies(Woh Saath Din, Meri Jung, Viraasat, Nayak to name a few) and even one from Telugu (Eswar) to make a name for himself in Bollywood. Jeetendra also successfully used Tamil and Telugu movie remakes. Are we looking at some secret success formula here?